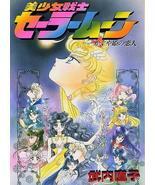 Product reviews for "Sailor Moon Manga"
THe movie in comic form! A lovely sweet manga that is the movie in it's entirety. The are minor differences between the anime and this book. You can see where Naoko Takeuchi really shines and all the work she put in creating the movie. Some graphics could be better, but all in all great. This manga is slightly larger than a normal manga.